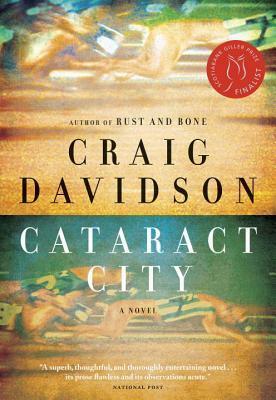 From Goodreads ~ Owen and Duncan are childhood friends who've grown up in picturesque Niagara Falls - known to them by the grittier name "Cataract City". As the two know well, there's more to the bordertown than meets the eye: behind the gaudy storefronts and sidewalk vendors, past the hawkers of tourist T-shirts and cheap souvenirs live the real people who scrape together a living by toiling at the Bisk, the local cookie factory. And then there are the truly desperate, those who find themselves drawn to the borderline and a world of dog-racing, bare-knuckle fighting and night-time smuggling. Owen and Duncan think they are different: both dream of escape, a longing made more urgent by a near-death incident in childhood that sealed their bond. But in adulthood their paths diverge, and as Duncan, the less privileged, falls deep into the town's underworld, he and Owen become reluctant adversaries at opposite ends of the law. At stake is not only survival and escape, but a lifelong friendship that can only be broken at an unthinkable price. Duncan and Owen live in Niagara Falls, ON, and have been friends on and off since they were kids. There isn't a lot of opportunity in Niagara Falls. Owen ends up being a cop and escapes for a few years by heading out west. Duncan works in the local cookie factory, supplementing his income by racing his greyhound, participating in illegal fights and agreeing to smuggle illegal cigarettes across the Canada/U.S. border. He is living with his former babysitter, Edwina, who also works at the cookie factory. The story starts with Duncan getting out of prison after eight years and asking Owen, who is back in Niagara Falls, to pick him up. The book jumps back and forth in time and changes perspective (first person voice) between Duncan and Owen. I started out enjoying this book but then I found that it started getting long about halfway (it seemed longer than 416 pages). I thought the writing could have been tighter. There was a lot of information and detail provided (more than I needed at times). As a head's up, there is swearing and gruesome fight scenes. I could have done without the detailed descriptions of abuse of dogs, dog fighting and the illegal fights Duncan gets into to make money. In general, I found it to be a dreary and depressing story ... there wasn't a lot of happiness. I found the ending was flat. After devoting so much time to this book and not giving up, I thought, "This is it? This is how it ends?"